So where do I start? 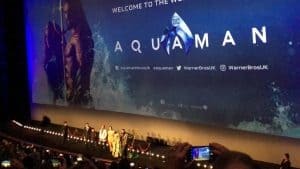 Is it watching the Aquaman movie? 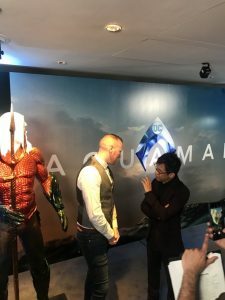 Is it meeting Director James Wan? 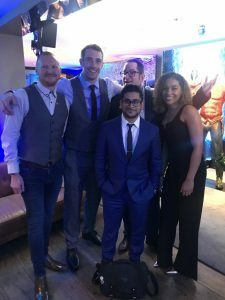 Is it the drinks reception or meeting Jason Momoa? Well let me take you on my journey and start at the very beginning. 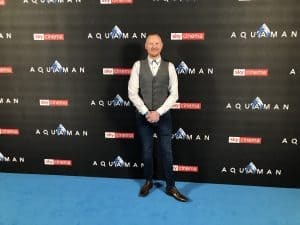 It all started while I was at work on Tuesday morning, I was checking my phone for some emails and one stood out massively, it was an email from Warner Brothers inviting me to a drinks reception and to meet with Legendary Film director James Wan and then go on to the London world premiere of Aquaman at the blue carpet event. I work in the same company as my wife and immediately got her to read this email as I could not believe what I was reading and yes it confirmed the above and I had to compose myself, after a few minutes I sent a reply email and said yes please. I actually could not believe this had happened and was checking my emails every minute for the rest of the day awaiting on responses which did come through and it confirmed a date which was the Monday the 26th of November and had to meet at a very swanky hotel in London and then we was going on to the blue carpet event and also going to see the Aquaman movie too. I couldn’t wait for the week to pass and as it got to the weekend and I was like a kid at Christmas, I could not sleep and was so excited for Monday to come and when it did I get up, I got dressed up very smart and headed off to London. 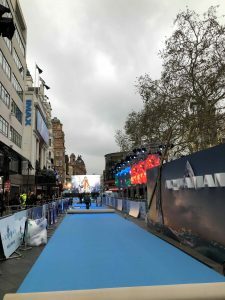 At first I was early so headed to Leicester Square to see some of the amazing blue carpet event get set up by the production team and it was amazing, inside the Cineworld cinema had video steps with clips of the movie playing plus a massive video screen upstairs with Aquaman on, this immediately got me buzzing more for the rest of the day. Just after this I met up with a fellow blogger called Luke who is the known as The Geek of Steel and he was also going along to the event later and we headed off to the hotel for the afternoon events. On arriving at the hotel we met up with Kibla Ahmed Art who is an amazing Artist and also a blogger like us who was Lukes guest. 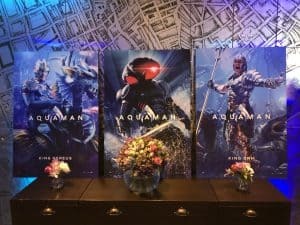 We all headed into the hotel and found where we had to go and as soon as you looked through a section there was the Aquaman costume, I have to say we were very excited to see this and wondered how many more fantastic surprises were coming and there was. 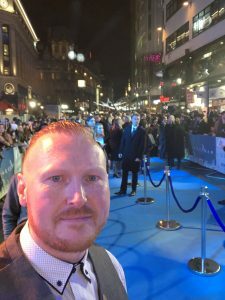 At this point and was greeted by some very lovely people from Warner Brothers and the media who greeted us and explained how the rest of the day was going to work for us including being taken to the blue carpet premiere later on in Leicester Square. We went inside and we was given our tickets for the premiere later on which looked cool and then was greeted by special drinks and cocktails which the one I had was a special Aquaman Blue Gin based drink which was lovely, they also had a green screen area to play with Aquaman’s Trident and this was fun to do as it created a video of you underwater with the Trident. It was around this point we also met up with another fellow blogger called Tasmin who is known as The Aspiring Kryptonian, we have chatted online for a while but this was the first time we had actually met up and it was good to have some fellow bloggers who all work very hard for what they love and are passionate about altogether at this amazing and epic event. 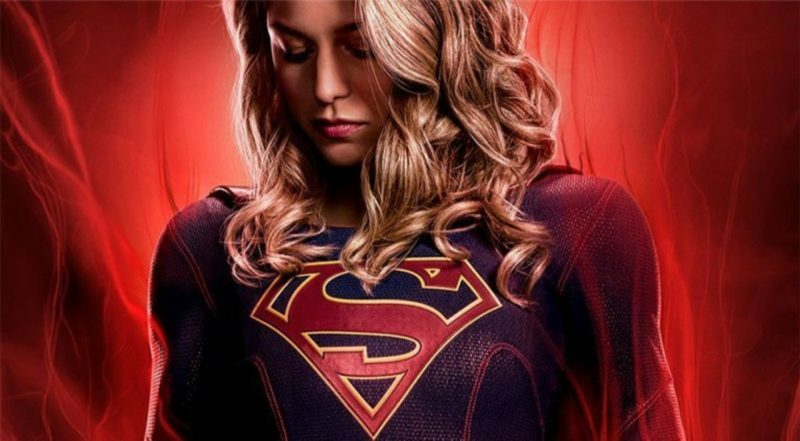 It felt like an amazing unbelievable reward for all of our hard work which we shall continue doing for as long as we love superheroes. 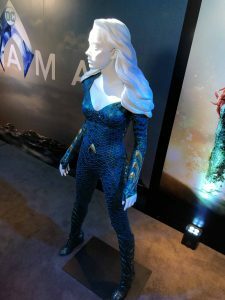 We all took pictures and videos and they even had the Mera costume out too, we were told the costumes were the actual ones used in the movie, there was big banners, photos and posters up also and it made it feel like a very cool Aquaman event. 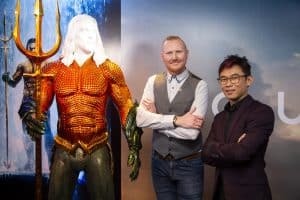 Then it was at this point the Legendary film director James Wan entered the room, to which we all got to meet him in turn and have a chat, take some pictures and video with him and I must say the man is amazing, James is very passionate about Aquaman and is so happy he got the chance he got to make it and he is also a big Aquaman fan too, he was full of energy which I absolutely loved about him and made me very positive that this movie will be a huge hit. 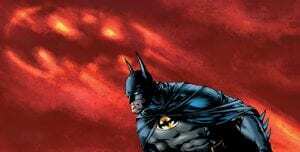 All my Videos plus an interview to come on DC World on movie release week as we can’t post until then, so stay posted. 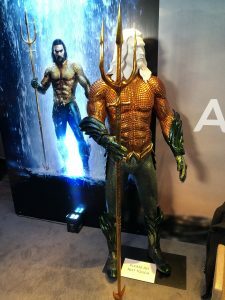 We was in the room for a couple of hours and then it was time to head over to Leicester Square but before we left Warner Bros gave us all a goodie bag which included a big Aquaman poster an Aquaman mug a Funko pop and a cool T-shirt too. We left in the car which was provided for us over to Leicester Square, we was all dropped off at the end of the Blue carpet area and then it was time to enter the blue carpet area I have to say I was buzzing and we all seem to split off at this point doing our own things and blogging and for the few minutes on the blue carpet I must say what an experience absolutely legendary, moments I will never forget. I filmed some of this and took some pictures even my friend Alex was in the crowds and called me over for a pic and then I headed into the cinema, I was walking in right behind Jason Momoa but couldn’t get a sneaky picture as he went off into another room as we got to the top of the steps, I went and had a picture in front of the media banner set up and then went into the screen, little did I know it was going to be in the IMAX which now I couldn’t wait for. We all sat down in different seats numbers and before the film come on the cast came in to introduce the film including James Wan, Jason Momoa, Amber Heard and Patrick Wilson, some of them even sat in the theatre with us to watch the movie apart from Jason who left at that point as he is waiting to watch the movie first with his children but not before breaking a Trident in half and leaving which was great to see (video at the bottom of this page) Then we watched the movie in glorious IMAX which I cannot talk about yet but once the movie is released I can give my review. 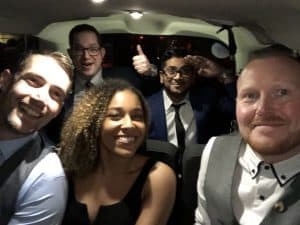 And that was it, the film ended and I met back up with fellow bloggers and went for a cheeky McDonald’s in Leicester Square to compare our thoughts and then we all made our way home actually couldn’t believe what a day we all had. Then the next morning I had an email confirmation to head back up for a press junket at the hotel again to which I did go and had to leave work very early thanks to my cool Boss. I arrived back to the hotel and met up with two lovely people from various publications and we sat down and had a nice intimate interview with James Wan and Patrick Wilson. 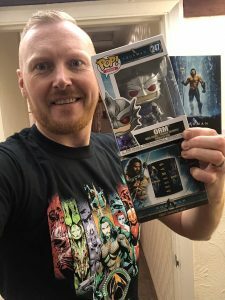 I couldn’t believe I got to meet Patrick as I actually got his character Funko pop yesterday, ORM who is Aquaman’s brother, this went absolutely well it was a great experience and a good laugh and this interview will be coming online on the movie release week. After this event I headed off to the forbidden planet comic store in London where they were giving out 100 wristbands to meet Jason Momoa and James Wan in the evening to which I managed to get one of the very last few. I queued up round the back of the store in the pouring rain with some others but this was well worth it as because Jason Momoa come out and sang to us with his banjo, this was an amazing experience and could not Believe it was happening, I even got some video footage of this which is at the lower part of this page. 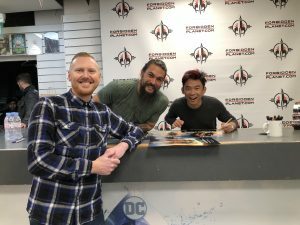 Then we went inside to meet Jason Momoa and James Wan who signed a poster for everyone and we also got to have a picture with them too. That was it, that was the end of my two amazing days in London and WOW what memories. 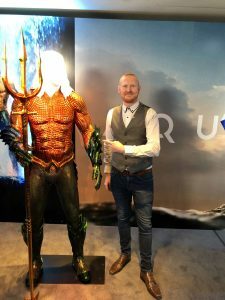 I have to say a massive thank you to everyone involved at Warner Bros and any other media involved in getting me to this event and for inviting me and looking after me and the others too, we felt very special and looked after it was an absolute pleasure, honour and a privilege to see Aquaman at the world premiere in London and also meet the cast and director. Thank you all and stay tuned to DC World in the coming weeks for a lot more once we can share with you all. 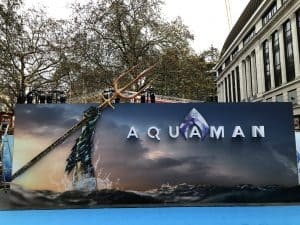 Aquaman is hitting cinemas in the UK from December 12th and later dates around the world and trust me, you don’t want to miss this.